Maryland-based designer and custom builder Genovation Cars Inc. has been in the industry for almost a decade and is producing some of the world’s top performance electric vehicles. Its top priority has always been to provide customers with fuel efficient and eco-friendly cars without compromising functionality, safety and the whole driving experience. Earlier this year, their Corvette Z06-based Genovation Extereme Electric Car (GXE) set the land speed record for the fastest street legal all-electric vehicle at 186.8 miles per hour. With a three-second 0-to-60 run and a top speed of 200 miles per hour, it is inevitably one of the fastest pure breed EVs of this generation. 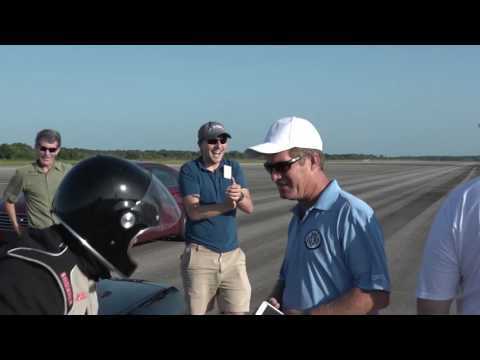 The car hit its record at the tarmac of the NASA Shuttle Landing Facility at the Kennedy Space Center in Cape Canaveral, Florida driven by multi-record holder Johnny Bohmer. Genovation Cars has always been about being the best and aims to stretch beyond its limits. Thus, in another recent run at the Kennedy Space Center, Genovation Cars has proved to the world that nothing, not even their own creation, can stop them from proving to the world that they truly are number one. The re-engineered Z06 Corvette reached a record-breaking speed of 205.6 mph (18.8 mph faster than its previous record), thanks to its all-electric power train. The Z06 chassis paired with twin electric motors adds an extra oomph to the all-electric Z06, allowing it to cover at most 130 miles with its 44-kWh electric battery on normal driving conditions. This particular GXE has been installed with state-of-the-art battery management system, inverters, batteries and electric motors. Even with this much on its plate, Genovation Cars still manages to maintain a 50/50 weight distribution on the Z06 to optimize a low center of gravity. It produces as much as 660 horsepower and 600 lb.-ft. of torque, enough to catapult the Z06 GXE towards success. While everyone has been gushing about how awesome Elon Musk’s Tesla Model S is, Genovation Cars was busy creating world records. Who could blame them? Tesla is already a reputable name in the automotive industry so what better way for people to notice an incredible creation like the GXE from a relatively newbie in the industry Genovation Cars Inc. than to test it in its natural habitat. And what better publicity stunt than to create a world record and beat the existing record which comes with the participation of the custom builder. Now, anticipation for the release of the GXE is building up and Genovation Cars must find a way to meet the demands. The car is already in its testing and development phase but Genovation Cars is already anticipating that they will be starting to accept pre-orders by the third quarter of this year. Also, not all good stuff comes in unlimited supply and so the GXE will sadly be a member of the limited-edition family. How many to be exact? We’re not sure yet so we’ll have to wait until later this year for confirmation from its manufacturers. But we sure are excited to see this bad boy rocking highways!